We rounded a corner and, at first, the gleaming white building looked to us like the Taj Mahal. An instant later we recognized the Moorish-inspired structure looming over a sea of green as Mission San Xavier del Bac. 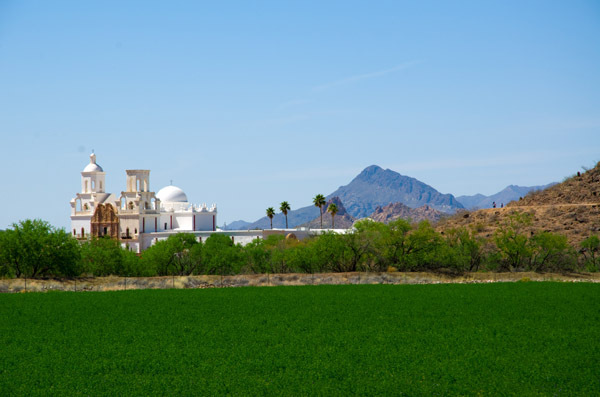 A short drive from downtown Tucson, Arizona, San Xavier stands as one of the most impressive missions we’ve visited in our tour of the Southwest. Its seemingly spotless white façade is a distinct contrast to the more ancient look of the San Antonio Missions. And its ornate architecture sets it apart from the simpler structures we found on El Paso’s Mission Trail. Even as we marveled at San Xavier’s exterior, it didn’t prepare us for what awaited us inside. Beyond the massive and elegantly carved mesquite-wood doors, lies a richly decorated sanctuary of wood and gold and vibrant color. Statues and carvings and frescos, combining elements of Spanish and Native American heritage, vie for your attention. Marbling and theatrical curtain displays add a richness and sense of drama. 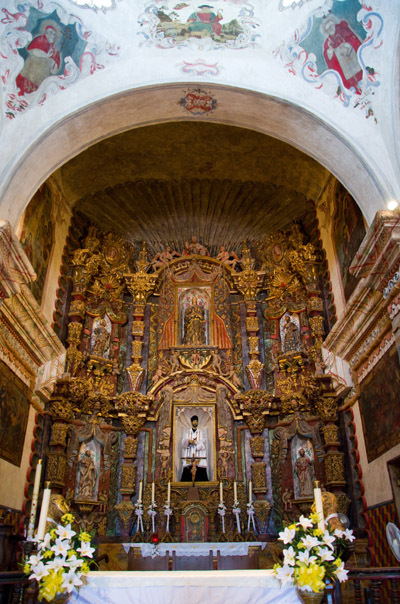 But despite all the busyness of its Baroque decoration, San Xavier also achieves the calming sense of balance appropriate for a functioning house of worship. San Xavier also operates a small free museum with several artifacts on display and a 20 minute video describing the Mission’s history. The museum is open daily from 8:30 am – 4:30 pm and the Mission Church is open 7:00 am – 5:00 pm, but check their website for a current schedule. I love reading about your travels when I can, very interesting…how I wish I could. Keep up with writings and remember, you’ll always have me looking for you. I love this mission! We visited numerous times on our way to Nogales, Mexico when we lived in Phoenix. Memories of the beauty and the “must have” Indian Fry bread came on me as I read this post. Beautiful pictures! Ah, fry bread. I thought about doing a post on it. We called it “fried dough” when growing up. In Belize they call them “fry jacks.” I wonder if fried dough and powdered sugar are some kind of universal cultural constant? Maybe I need to do some more traveling to find out. Darn. You may be right about the cultural constant. Beaver tails in Quebec City are so similar – only difference is you have the choice of Nutella as a topping! Beautiful pictures. Thank you for shedding light on a little known gem just south of Tucson. Everytime I visited, I was reminded of how much faith this culture had to put all of their riches into their place of worship. Stunning photos. Gorgeous white mission. Ornate decoratings. Wonderful. Re: “fried dough” – I think that’s called pizza fritte in Italian. Sugar dusted. Wonderful. Wow! I had no idea something some incredible was in Tucson! At first glimpse, I thought the photograph was of a Spanish Cathedral because it was so intricate! I am very surprised and happy that this architectural beauty can be found in the states! Visiting churches during travels is always the best. They’re free and provide lots of history and insight into the area. Enjoyed reading about this one! We’re honored and glad you like our blog. Amazing adventures on this blog, tempted to pack my suitcase and embark on the traveler’s path!